Note: The September trip has filled, but we are now booking a second group for those dates! 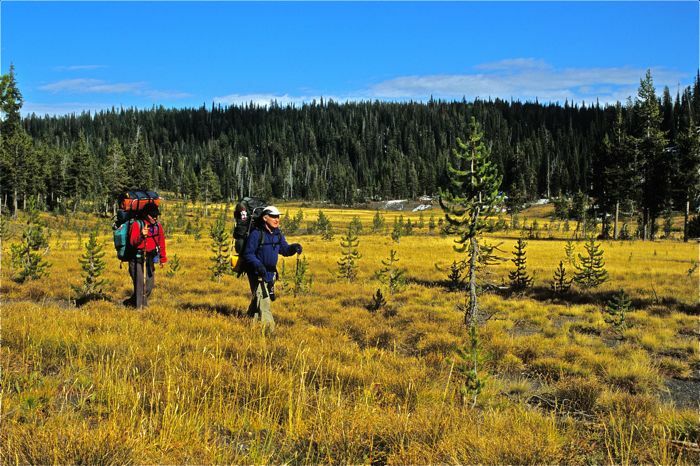 This Yellowstone backpacking trip has it all: the huge Bechler Meadows, lush old-growth forests, big rivers and big mountain views, rolling pine-covered plateaus, hot springs soaking, the largest wilderness lake in the contiguous U.S., and the greatest array of big waterfalls you’ve ever seen! The Bechler River Canyon is unbelievable. Summer trips include warm weather and spectacular wildflower blooms. By September the mosquitoes are gone, there’s a tinge of frost in the air, fall colors are exploding, and the spine-tingling bugle of bull elk in the rut are just a few of the wonders of early autumn in the wild Yellowstone backcountry. Nearly all of Yellowstone’s varied wildlife thrive here. Unlike other outfits that simply run folks from Old Faithful to Bechler, we explore the full diversity of this area, including Shoshone Lake and Geyser Basin. The topography is relatively gentle and the trails are well-maintained. We rate this trip as moderate and its base is Bozeman, Montana. 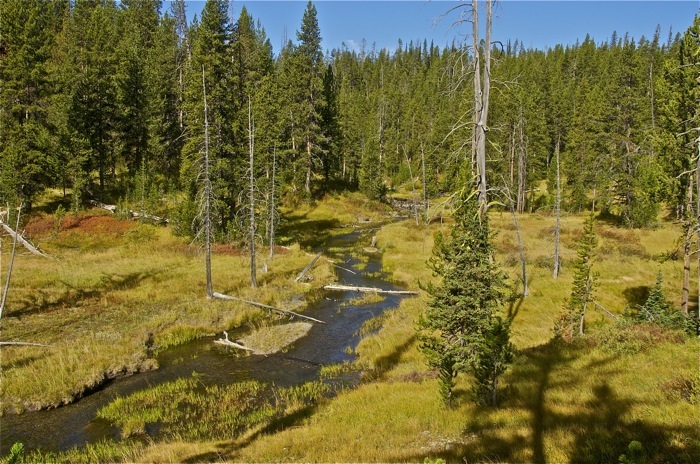 We begin this trip near Old Faithful and hike via Shoshone Lake over the edge of the Madison Plateau and then down the spectacular Bechler River Canyon to the Bechler Meadows. 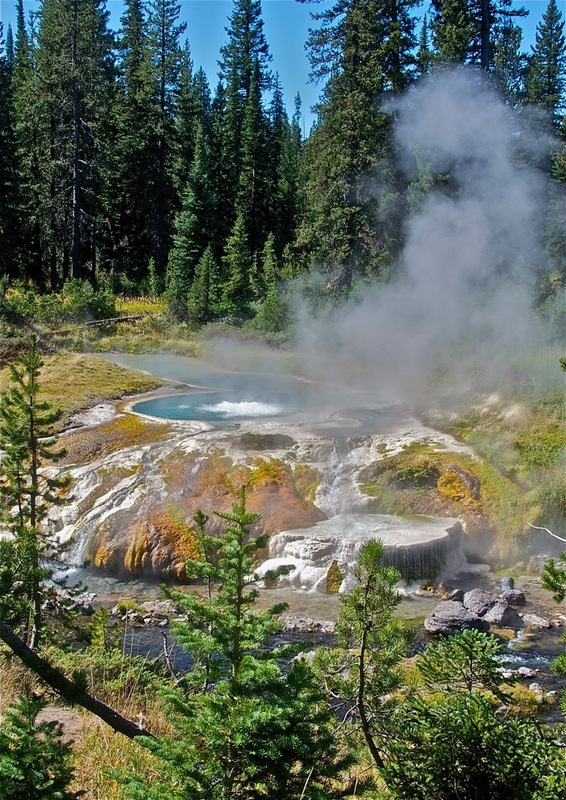 There is a mid-trip opportunity to soak and cleanse in one of the premier backcountry hot-springs anywhere on Earth! We end the trek at the Bechler Ranger Station in the far southwest corner of the park. TREK BASE: Bozeman, Montana. Comfort Inn, 1370 N. 7th, Bozeman MT, 406-587-2322. MEETING TIME: Pre-trip orientation plus safety talk and food and gear hand-out at 6 PM the evening prior to the first trip day. For example, if the trip is the 12th-18th, we meet at 6 PM on the 11th, in the Comfort Inn lobby. TRANSPORTATION: Air service to Bozeman, motel provides ground transport from airport. Please make flight reservations promptly, as summer flights to Bozeman may quickly fill. If they do, Billings and Helena are viable alternatives. TREK RATING: This trip is moderate. Most of the route is on good trails; the terrain is a gently rolling plateau cut by the Bechler River Canyon. We do, however, cover quite a few miles, so good endurance is important. Daily backpacking mileage is 6-10 depending upon campsites; total mileage is 35-40. ELEVATIONS: 6400-8500 feet. Maximum single day elevation gain with backpack about 1200 feet. WEATHER: Summer is usually pleasantly warm with cool nights and occasional afternoon thundershowers. 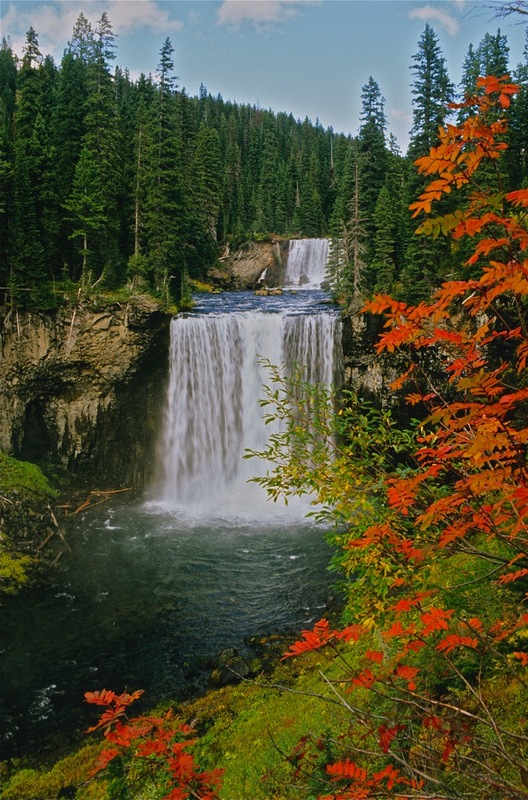 Early fall brings widely varied weather. Clear nights are below freezing with sunny mild days. But we must also prepare for cold rain or snow. Click here for the National Weather Service forecast. FISHING: Primarily in Shoshone Lake and the Bechler River. A Yellowstone fishing permit can be obtained when we enter the park. Please inform us if you plan to fish. 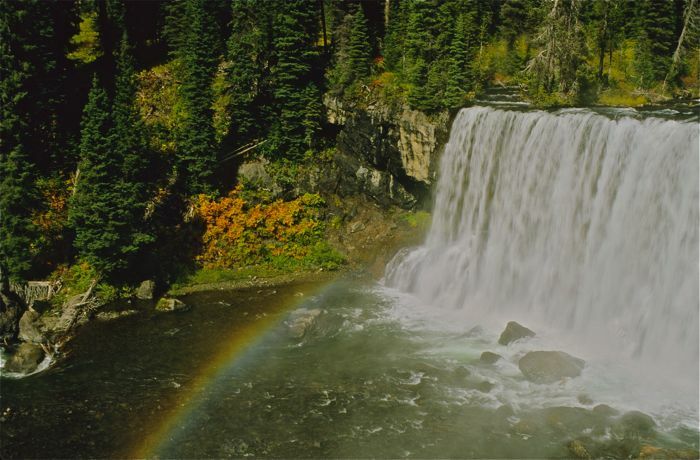 Huge waterfalls, big meadows, unusually lush forests for the Yellowstone Ecosystem, great views of the Tetons. Shoshone Lake is the largest wilderness lake (no road access) in the lower 48 states. Bathe in natural hot springs! In September, fall colors and bugling bull elk. Wildlife includes bison. The amazing Bechler River Canyon! The most varied and spectacular scenery imaginable! SPECIAL TIPS: There are black bears and grizzlies, so eschew deodorants and other smelly products. Be prepared for a number of river and stream fords. 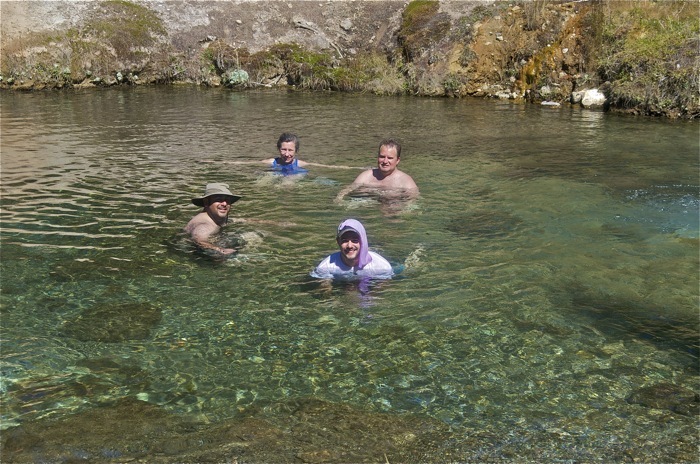 Bring a lightweight swimsuit for the hot springs. STATUS: The Yellowstone backcountry has not been designated Wilderness by Congress due to politics. In 1872 Yellowstone became the world’s first national park. ITINERARY: This is usually a one-way trip with a pre-arranged vehicle shuttle. Our beginning trailhead is not too far from Old Faithful; we usually end the trip at the Bechler Ranger Station in the southwest corner of the park. Please Note: Because we are flexible and vary the route and camps depending upon conditions, mileages and details including elevations are approximate, not exact.